The best part about Thanksgiving — other than that clutch afternoon couch nap, of course — is all the options. There’s stuffing, cranberry sauce, your aunt’s famous mashed potato casserole at the dinner table and a ton of exciting movies to choose from in theaters. 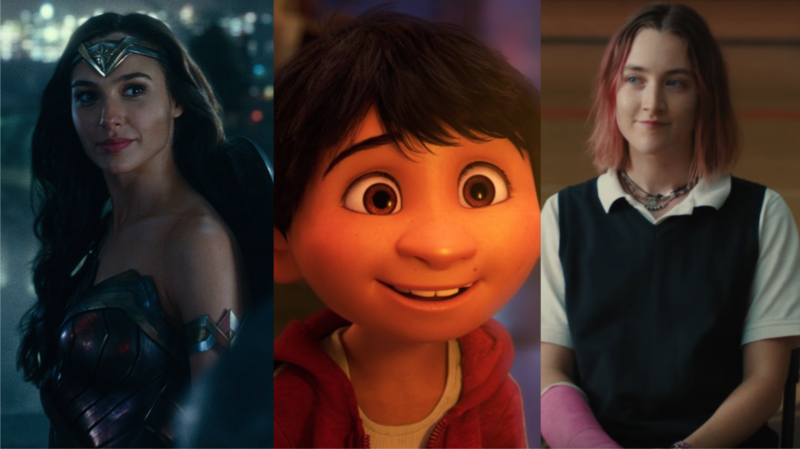 Better yet, Thanksgiving weekend is basically the unofficial start of awards season so the big-screen offerings tend to crank things up a notch, and this year is no exception. In the grand Pixar tradition, Coco is getting rave reviews for its heartfelt story and the eye-popping universe it explores. Based on Mexican holiday Dia de Muertos (Day of the Dead), the story follows 12-year-old Miguel, his smiling skeletal ancestors, and his dog pal Dante as they journey across the Land of the Dead. From everything we’ve heard, this indie dramedy starring Saoirse Ronan is straight FIRE. Roseanne‘s Laurie Metcalf plays a frustrated mom with a tense relationship with her angsty teenage daughter, Ronan’s titular Lady Bird. It looks super relatable and charming, plus we’re all about embracing female-focused stories like the one writer-director Greta Gerwig is telling here. Classic Agatha Christie murder mystery + scenic and old-school train travel + Judi Dench and Daisy Ridley AND Josh Gad with a jaunty little mustache? Count us in. If you like your superhero movies with a goofy sense of humor and Jeff Golblum in metallic guyliner, this is a fun pick. Thor winds up on another planet where he’s pitted, gladiator-style, against some fearsome opponents, but he’s more concerned about saving the world from his evil sister, Hela (a fierce AF Cate Blanchett). This whimsical-looking film, from Tangerine director Sean Baker, has Academy Award contender written all over it. Critics are digging Willem Dafoe’s performance, but it’s the kids at the center of this story about life at a budget motel near Disney World that are getting the most buzz. Young star Brooklynn Prince has a bright future ahead of her for sure. Based on the bestseller of the same name by R.J. Palacio, this movie is one the whole family can get behind (you know, if your whole family is into inspirational dramas). Room‘s adorable Jacob Tremblay plays Auggie Pullman, a young boy with facial differences who’s starting at a new school. Bonus: Julia Roberts and Owen Wilson play Auggie’s mom and dad. Sometimes you just need a big-budget superhero movie. This one’s got Batman (Ben Affleck), The Flash (Ezra Miller), Aquaman (Jason Momoa), Cyborg (Ray Fisher), and last but NEVER least, Wonder Woman herself (Gal Gadot) joining forces to face a new powerful enemy. Armie Hammer plays Oliver, a student working as a research assistant for 17-year-old Elio’s (Timothée Chalamet) father, in this summer love story. Oliver and Elio spend the summer at the Italian villa of the latter. And sure enough, the sparks of young love soon fly. In case you’re the person who has their Christmas tree up before the Thanksgiving dishes are done (or before! ), this sequel stars funny ladies Kristen Bell, Mila Kunis, and Kathryn Hahn as overwhelmed moms breaking the mom rules, holiday-style. Happy Thanksgiving, and happy watching!